Myths were already used to reconstruct the geological risk of certain areas and may also be of interest for prospecting geologists. 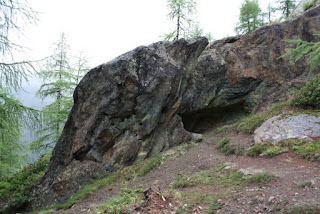 Still many modern localities bear names associated to past mining operations, precious metals or ore. A lateral valley of the South Tyrolean Ahrntal is known as Röttal, “Röt" meaning red and named after the reddish rocks found there. These rocks are ore-rich greenschists, the reddish colors caused by alteration and weathering over time of iron- and sulfur-minerals (often associated with more valuable minerals). 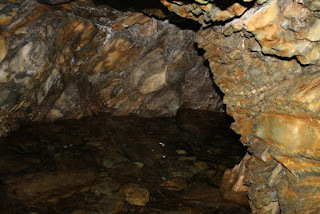 Probably this and other geological clues (like rivers poisoned by traces of copper and poor plant growth) helped once to discover the copper deposits deep within the mountain. Fig.1. View of a small creek in the "red" valley. According to a local legend the nearby mine of Prettau was discovered when a wild bull throw some large rocks into the air. The owner of the animal noted some shiny minerals inside the rocks and even if not gold, so he had found a rich deposit of copper- and iron sulfides. Maybe this legend reflects the idea of using such well visible geological clues, like minerals or alteration products, do discover the hidden treasures of a mountain. Mining for metals in the Alps dates back at least for 4.800 years (a 25m long gallery in North Tyrol was dated to 2.800 B.C. ), in South Tyrol slag remains were dated to 1.200-1.000 BC for sure. Slag remains found in Ahrntal possibly date back to the early and middle bronze age (3.300-1.800 BC), even if the provenance of the used copper ore is unknown. 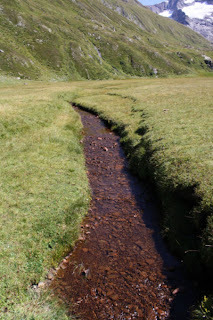 The extraction of copper ore in the Ahrntal became important only in medieval times, especially in the 15th century. Fig.2. Medieval prospecting pit in ore-bearing greenschists (prasinitic) rocks. So it´s interesting to note that some galleries found in the Ahrntal are, according to local folklore, associated to the Roman dominion. The galleries excavated in gneiss are not especially deep, the longest recorded is just 40m. It´s for sure only superficial prospecting, soon abandoned. Fig.3. A supposedly haunted pit, entrance to a short gallery excavated into the weathered grey gneiss, in yellow alteration rim. In local folklore the galleries are called “antrischen Löcher”, "antrisch" an old term to describe something spooky or haunted and "Löcher" simply meaning hole. The antrischen Löcher were inhabited, so the legend tells, by descendants of the first man and women. However as Adam and Eve tried to hide their illegitimate children before god, they now are damned to live in the underground. They are the guardians of underground treasures and eventually will donate the hidden treasures to good people, if they deserve such gifts. According to historic archives some galleries date back for sure to the year 1530, when a mister Franz Widmair requested permission to prospect for ore in this area. Mines dating back to Roman times are a possibility, even if highly unlikely, as there exists no written record or artifact made of the extracted ore to prove Roman mining operations. Folklore also tells of silver-veins, even if the petrological composition of the rocks would suggest copper. The found ore is anyway of no economic value nowadays. 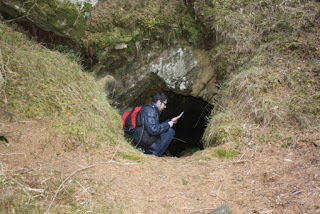 Now even if geology contradicts some speculations based solely on local tales (like the galleries dating back 2.000 years and the search for silver), it´s nevertheless interesting to note that without the legends surrounding these artificial galleries and pits these would have probably soon be forgotten. By following and evaluating tales provided by locals a geologist may discover some interesting additional information to include in a geological map, be it abandoned mines, quarries or minerals- and ore-associations.